Choose one of our variety packs of 48 beautiful black stick-on chalkboard labels in 8 stylish designs. Label Packs come with one liquid chalk pen in any of eight colors. Choose our Pen Pack, which includes eight liquid chalk pens in eight terrific colors. Note the Pen Pack doesn’t include chalkboard labels. peel off and stick them on. Labels can be removed and repositioned, and the liquid chalk can be removed with a damp rag. Use them again and again! These stick-on chalkboard labels and liquid chalk pens give you bright, colorful, distinctive labels that really stand out. 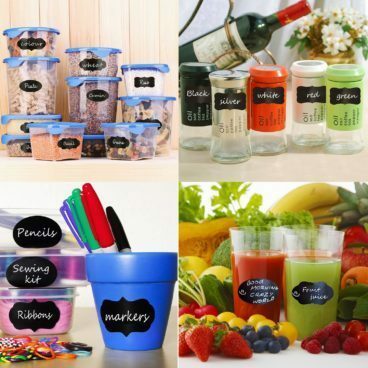 Perfect for jars, storage boxes, shelves, or personalizing anything you like. The chalkboard labels are made with high quality vinyl, are waterproof and will continue to look great for years. The liquid chalk pens will stay bright and bold when used on the chalkboard labels.